The 8 Days Uganda mountain Gorilla safari takes you through the chimpanzee safari destination of Kibale, Mount Ruwenzori hiking encounter, wild game viewing and Kazinga Channel recreational boat encounter in Queen Elizabeth National Park, gorilla trekking encounter in Bwindi Impenetrable National Park, the boat ride on Lake Bunyonyi with its 29 islands, scenic views of Kigezi highlands named the Switzerland of Africa, the night game encounters in Lake Mburo National Park. The 8 Days Uganda Mountain Gorilla Safari incorporates primates with other wild game, scenery and recreational water encounter thus it is an amazing experience worth undertaking. Day 8 of the 8 Days Uganda Mountain Gorilla Safari: Do a morning game walk & transfer to Kampala. 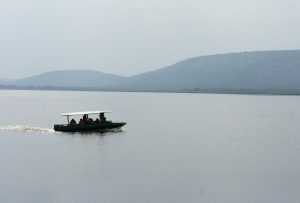 After breakfast, undertake a morning boat ride on Lake Bunyonyi not exceeding 2 hours exploring few of its islands amidst the mist covered Kigezi highlands. After the activity embark on the transfer back to Lake Mburo National Park 199km. You will have a lunch stop at Igongo cultural center 12km past Mbarara after which you will continue to Lake Mburo National Park 33km from Igongo. Check in at your lodge and relax so as to prepare for a night game drive in the park commencing at 7pm. The night game drives do not only offer you chances of spotting day grazers like Impalas, buffaloes and Zebras as they rest but also nocturnal species as they set out to hunt like leopards, jenet cat, hare, white-tailed mongoose, bush pig, hyena, serval cat, civet, porcupine and aardvark. Day 8 of the 8 Days Uganda Mountain Gorilla Safari:Do a morning game walk & transfer to Kampala. After breakfast, have a morning game walk, exploring wild game on foot at the same time enjoying the acacia scenic landscape of Lake Mburo. The savannah vegetation marked by rolling grassland and thicket with acacia wood land dotted with rolling hills with protruding Precambrian rocks not forgetting series of Lake that mark the valley floors combine to make the nature walk encounter at certain look out points like Kazuma hill memorable while on Lake Mburo National Park. After this activity, embark on the transfer to Kampala 240km about 3 – 4 hours’ drive. You can make a stop at the equator crossing – Kayabwe for amazing water experiments to justify the geographical divide between the south and northern hemispheres and amazing photo shoots. Drive for the remaining 77km to arrive in Kampala in the evening.